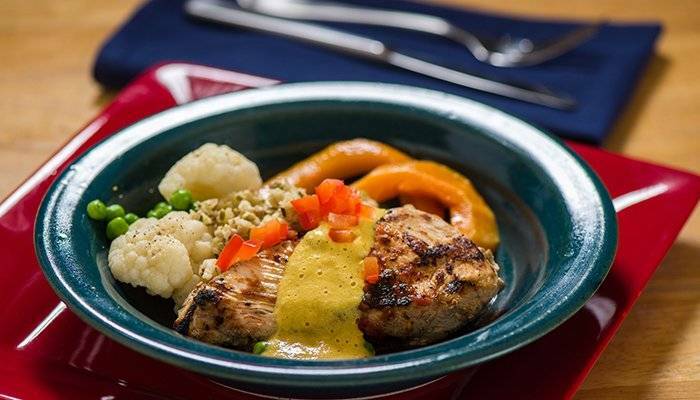 Our famous recipe for Grilled Mango Chicken. The char of the BBQ and the freshness of the mango is the perfect combination for a flavourful and colorful dinner. The fresh mango provides a hint of sweetness and rich color to this recipe. We frequently surprise guests when serving this mock rice since it truly has the look and texture of the real thing. Serves 4. Score the chicken breasts by cutting partially through in a criss-cross pattern. Blend all the marinade ingredients together well. Pour the marinade over the chicken, reserving 1/3 for serving with the cooked chicken. Marinate chicken a minimum of 2 hours, or up to 24 hours. Grill the chicken on the barbeque until done through. Meanwhile, steam the cauliflower in a little vegetable stock and drain well. Roast the seeds then put through a food processor to chop finely. Mix the cauliflower with the seeds and yeast and keep warm. Warm the mango sauce and drizzle on the finished chicken. Serve with the rice on the side. Garnish with the fresh herbs. To download find more Mountain Trek recipes and to get the shopping list for this recipe, download our Health Guide in Your Pocket App now.